The Region’s Premier Heart Hospital The heart is the rhythm of life, and Boone Hospital is there for every beat. More experience, more expertise, and more compassion make Boone the region’s premier heart hospital. From diagnosis and treatment to rehab and recovery, we’re there for you every step of the way. That’s the Boone Touch. Follow us Check us out on Facebook, Twitter, Instagram, Pinterest and YouTube. 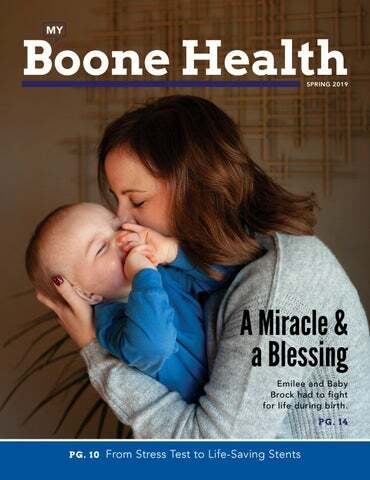 For a FREE subscription, call 573.815.3392 or visit myBooneHealth.com and click on the subscription link on the right side of the page. The U.S. Centers for Medicare and Medicaid have rated Boone Hospital Center as 5-star, placing us in the top 8 percent of hospitals nationwide. Thank you to our physicians, nurses, support staff, volunteers and foundation for providing excellent care to our community. That is the Boone Touch. t Boone Hospital Center, we have ten Standards of Excellence defining the qualities required to become and remain a Boone Hospital teammate. Our #1 and most important Standard of Excellence is “Promote safety.” Providing the highest quality care in the safest environment, for our patients and staff, is our highest priority. We have long established patient safety protocols in place such as the “time-outs” we execute prior to the beginning of each and every invasive or surgical procedure. This protocol is systemically designed to assure we perform the correct procedure, on the right site, on the right patient, if their clinical condition indicates it’s safe to proceed. Patient fall risk protocols, patient lifts, handrails aligned from patients’ bed to their restrooms, and clinical protocols to prevent conditions such as pressure ulcers, post-operation hemorrhaging, respiratory failure, or infections, are a few more examples of how the Boone team promotes patient and teammate safety. Providing the highest quality care in the safest environment, for our patients and staff, is our highest priority. These high standards for safety require each of our teammates to be leaders. A teammate who speaks up during a procedural time-out, who follows through in applying each step of a safety protocol, who cleans up a water spill on the floor to prevent a slip and fall, and who assists their teammates in safely caring for each and every one of our patients demonstrates exemplary leadership. More recently, Boone has implemented significant components of a Just Culture environment. This culture promotes open, honest and transparent reporting of events, like medication errors or near-misses, which facilitate more accurate reporting and effective solutions. Additionally, we’ve embarked upon a journey of implementing an operating system that supports daily safety huddles, shift readiness boards and tiered escalation for more efficient problem-solving. These initiatives position Boone as a highly reliable organization. All of these efforts are designed to reach the ultimate goal of doing Zero Harm to our patients. Your Boone team is committed to your safety and to upholding our most important standard of excellence: Promote safety. Boone Hospital Appoints First Executive Director of Patient Care Services Laura Noren, MBA, BSN, RN, NE-BC, was recently named Boone Hospital Center’s first Executive Director of Patient Care Services. In her new role, Laura is responsible for inpatient care services, patient care policy and procedures, clinical outcomes, training and development and the Magnet program for nursing excellence. Laura first joined Boone Hospital in 1992 as a Training and Development Specialist and has since held several roles, including Service Line Director for Boone Hospital’s Women and Children’s Services and Director of Patient Care Support Services and Nursing Administration. Boone Hospital Center was rated a 5-star hospital by the Centers for Medicare & Medicaid Services (CMS) on its website medicare.gov/hospitalcompare. It is the only hospital in mid-Missouri to receive this recognition. The hospital ratings range from 1 to 5 stars. The more stars, the better a hospital performed on the available quality measures. The quality measures rated are the hospital’s mortality rate, safety of care, readmission rate, patient experience, effectiveness of care, timeliness of care and efficient use of medical imaging. The overall hospital rating shows how well each hospital performed, on average, compared to other hospitals in the U.S. The most common hospital rating is 3 stars. Electrophysiology specialist Dr. John Verbsky performed a procedure that helped get John Weston back on the golf course. Dr. Verbsky studies the image of a diseased heart. John Weston is able to golf again after a successful ablation procedure. talk much, called the ER, put me in a wheelchair and took me straight over to the hospital.” Once in the Emergency Room, the nurses gave Lisa nitroglycerin to help with her tightened chest and pain. Since Lisa was already fasting for her stress test, she was able to go right in for a cath lab procedure. “I was having pain and tightness in my chest because my artery was clogged,” said Lisa. “They put in my stent and started to wheel me back to my room and my EKG started to do weird things, and I began to have chest pain again. They took me back to the cath lab and discovered I had a blood clot forming where the stent was placed. They went in and placed a stent end-to-end with one of my older stents and got the blood clot out.” Lisa stayed in the hospital 4 days after her emergency procedure. “There was no hesitation in my treatment. I was very impressed with that during this scary time. They saved my life!” A Helping Hand through Kindness “Everything with my treatment was so great! All the nurses and staff - Jason, Kendra, Richard and Tabitha to name a few, even the guy who fixed my blinds was so kind to me,” says Lisa. Tim Salisbury and speech therapist Kelsey Kramper play Taboo during their therapy sessions. Taboo helps Tim with his word-finding skills. Finding the Words After treatment with a Boone Therapy speech therapist, Tim Salisbury is cracking jokes again. When 63-year-old Tim Salisbury opened his eyes on September 14, he quickly realized he was in a hospital bed, but wasn’t immediately sure why he was there. The day before he had been on the phone when he started having trouble speaking. His arm felt numb and his fingers were tingly. Tim told his wife he was going to go lay down, but not long after, she came in and said he didn’t look good and they needed to go to Boone Hospital Center. The rest of the day is mostly a blur, but Tim recalls being in the Emergency Department, and receiving an MRI and a CAT scan. The next morning, Tim opened his mouth to speak. “I’m okay,” Tim wanted to say, but nothing came out. He tried several more times to speak, but all he could say was his name. It was then that Tim learned he had suffered a stroke. Tim’s stroke had impacted his ability to produce language and his ability to formulate specific speech sounds. These deficits are known as expressive aphasia and apraxia of speech. Tim was also exhibiting neurogenic stuttering, which can sometimes result from a stroke. In addition to his speech difficulties, Tim had weakness in his arms and legs, decreased coordination, difficulties performing activities of daily living, double vision and difficulty walking due to poor balance. sentences in conversation. Taboo helps bridge the gap between drills and conversational speech, and he is getting pretty good at it,” says Kelsey. Tim’s family even purchased the game as a Christmas gift, so they can practice with him at home. “At first, I could hardly say anything, but with Kelsey’s help I was able to get my speech back. I am actually able to say what I am wanting to say,” says Tim. Tim loves to laugh and enjoys telling a good joke now and then. He says one of the best parts of his speech improving is being able to express his sense of humor. “When I had to talk real slow and think real hard, I wasn’t able to have fun and crack jokes. I feel like I’m able to be myself again,” says Tim. Every week Tim has shown dramatic improvement. Tim’s speech is now almost back to normal and he is about to graduate from speech therapy. Tim completed his work with Physical and Occupational Therapy last fall. “I’m glad I’m doing better, but I’m going to really miss Kelsey. I’m just going to have to come back and say hi sometimes,” says Tim. By Madison Loethen For more information about Boone Therapy’s speech, occupational or physical therapy services, visit boone.org/therapy or call 573.815.3868. The Lenz Family; Travous, Emilee, and son, Brock. From right to left; Abram J. Elsenraat, MD, Emilee, Sarah Bernard, MD and Leah Smith, MD. Emilee and her sister, Erica Peters. Amniotic Fluid Embolism (AFE) occurs in 2.5 of 100,000 births in the US & Europe (1 of 40,000 US only). she was also thinking about what my wishes were for my son. This was honestly my first real memory I have since checking in October 2.” During recovery, Emilee had to take walking and other daily tasks in small increments. “I remember in step-down I got up to walk for one of the first times and I came out of my room with a walker and made a lap around the nurse’s station. All the nurses were cheering me on and so amazed that I was up walking. Those nurses were some of my biggest cheerleaders and truly supported every small improvement I made.” BABY BROCK Brock spent six hours in the NICU at Boone before he was transferred to Women’s and Children’s Hospital just after birth to be put on a cooling treatment. He was there for two weeks. He was born on October 3 and released on October 13. “The first day I got to hold my son was October 11,” says Emilee. “Brock is such a blessing. He is 16 months old and all boy. He tests the limits, is sassy, loving, and full of life. He is meeting all of his milestones and brings our family so much joy. He is a truly a miracle and blessing. “The simple fact that he not only lived through our AFE, he also lived with no long-term problems is astonishing and a true testament to the care we received at Boone. Rest when your baby rests. It’s simple, but true! Your baby will demand your time morning and night with feedings every two to four hours, so sleeping while they sleep is a great plan. Accept and ask for help from friends and family. Housework and meal prep are a few things that can be hard for new parents to find the time to do. Friends and family will help you out, but they may not see everything you need unless you specifically ask for help. Don’t be afraid to speak up. 2. For safe sleeping, remember your ABC’s: •	A for Alone: Baby should not sleep with other people, pillows, blankets, or stuffed animals. •	B for Back: Baby should sleep on their back, not on their stomach or side. •	C for Crib: Baby should sleep in their own crib, not on an adult bed, sofa, cushion, or other soft surfaces. 5. Have a support system. Plan who you will call when you need help. No parent is perfect, and you shouldn’t expect perfection from yourself. A lot of questions will come up when you’re taking care of a newborn. When you have questions, write them down for your next doctor visit. If you need help quickly, ask your physician if they have an after-hours help line. Most pediatricians provide this service. Boone Family Birthplace supports new parents after they take baby home by offering a lactation consultant line and our monthly parenting support group, Bringing Up Boone Babies. 6. Enjoy your baby! They grow and change so quickly. Bringing Up Boone Babies is a monthly support group provided by Boone Family Birthplace. We meet on the third Thursday of each month at 10 a.m. at Boone Hospital Center. Each hourlong session is led by a Boone Family Birthplace nurse and includes a short presentation on a different topic, followed by open group discussion. This support group is free and open to all parents of newborns, infants, and toddlers – and you’re welcome to bring your baby with you. No registration is required. SNACKS TO KEEP YOU MOVING As the weather warms up, going for a hike is a fun, healthy family activity, or a great way to find some peace and quiet. Having just the right snack in your pack can help keep you moving and enjoy a longer hike. •	Sliced fruits and veggies •	Dried fruit •	Fruit and nut bars •	Squeeze pouches of yogurt or puréed fruit •	Cheese cubes or string cheese (These work fine if eaten within a couple of hours) •	Dried meats •	Nuts •	Trail mix •	Peanut butter sandwiches •	Don’t forget to pack water! Instructions 1. Add almonds to food processor, pulse to a coarse meal. 1. Add walnuts, almond flour and salt to food processor. Blend until you have a coarse meal, then set aside in a separate small bowl. 2. Add dried fruit to almonds and blend together in food processor. 2. Blend pitted dates in food processor. They will gum up into a ball in the food processor container: separate the date ball into a few smaller chunks in the food processor, then pour in the nut mixture. 4. Refrigerate until firm and cut into bars. 3. Press mixture into a parchment paper lined 8-inch square dish. A New Beginning for All Spring is the perfect time to build healthy habits together as a family! The smell of spring in the air means longer days, warmer weather and signs of new life, as trees start to bloom, flowers start to grow and fresh gardens are planted. With the cold and snowy days behind us, spring is a time of new energy and motivation for the entire household, as families head off to the trail for a bike ride, or pick tomatoes and cucumbers from their garden for the dinner salad. Spring is a wonderful time for the entire family to get outdoors. Fewer layers are needed for family walks. Time playing outside is extended as the sun is up longer and our bodies can soak up some much needed Vitamin D. Children ages 6 to 17 need at least 60 minutes of physical activity every day â&#x20AC;&#x201C;â&#x20AC;&#x201C; and those younger than 6 need even more. As children become more stationary, your family should soak up the opportunities that spring provides before the weather switches to hot and humid. Fun family outdoor activities: •	Ride bikes on the MKT Trail •	Visit a local park •	Make “kindness rocks” •	Do a nature scavenger hunt •	Fly kites •	Have a parents vs. kids soccer game •	Visit a local farmers market •	Pack a picnic •	Plant a garden •	Sign up for the Kids on Track kick-off in May at boone.org/kidsontrack Spring is also a great time to refresh your family’s diet. Winter months bring plenty of holidays, each with their own array of sweets, sweets and more sweets, as well as the warm comfort foods we crave for dinner. With the freshness of spring arrives the beautiful colors of the fresh, local produce in season. If you’ve thought about changing your family’s dietary habits, such as eating more fruits and vegetables, spring is the perfect time to start. Whether you enjoy them as side dishes or additional veggies in a favorite dish, spring offers delicious, natural choices the whole family will enjoy. You Have Cancer Dealing with my diagnosis by living in the moment. grew up in California and majored in English at the University of California at Berkeley. I’d always been a good science student, but wanted to become a screenwriter, so I moved to Columbia and earned a master’s degree at the Mizzou School of Journalism. But before I could return to California and write movies, I met my future wife, Kim. She suggested I revisit my early interest in science and technology. I completed my medical school prerequisites at the University of Missouri, then followed Kim to Memphis. I started medical school at the University of Tennessee while Kim worked as a TV news producer. We moved back west for my neuroradiology residency at the University of Washington and started our family in Seattle. After completing my residency, we moved to my wife’s hometown of Little Rock, Ark., where I joined a private practice radiology group and built an interventional neuroradiology service to treat brain aneurysms and strokes. We realized we missed the charming “big small town” of Columbia and wanted to move here to raise our children, Jacob and Emily. 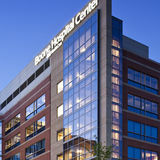 In 2008, I joined Radiology Consultants at Boone Hospital. I’ve served as the radiology department chair and just started a 2-year term as chief of Boone Hospital’s medical staff. Kim currently serves on the Boone Hospital Foundation board. As teenagers, my kids both volunteered at Boone Hospital. Jacob just graduated from Grinnell College in Iowa, and Emily is studying at Washington University in St. Louis. We feel strongly that the citizens of mid-Missouri need a strong Boone Hospital, and we will work hard to support Boone. edge technology. Sometimes when we use our catheters to retrieve a clot from the brain of a patient having a stroke, their weakness and inability to speak improves right in front of us. As a physician, this is as close to an instant cure I will ever see. What is the most challenging aspect of your job? As I read X-rays and CT and MRI scans, I often find serious diseases like cancer in otherwise healthy people. While it’s gratifying to solve the mystery of why someone is sick, I often have to deliver terrible news that will change people’s lives. What do you see changing in health care in the next five to 10 years? Advancements in computers and artificial intelligence will help radiologists work faster and more accurately. We’re going to need the help as America’s aging population will make us even busier. What advice would you give someone looking to become a doctor? Spend time working or volunteering in a hospital. You might be a brilliant student, but if don’t like being around patients, doctors, nurses or other hospital staff, you won’t be happy. What do you enjoy doing outside of work? When not hiking and bicycling in Columbia’s parks with my family and dog, I enjoy planning and taking trips to favorite places and places I’ve never been. I play video games occasionally to keep up my handeye coordination. What advice would you give to someone who is going to be a patient in a hospital for a period of time? I’ve been a patient myself and lost both my parents to cancer when I was young. But I also watched with joy as both my kids were born in the hospital. Being a patient or having a loved one in the hospital is often stressful and scary. Don’t be afraid to ask the medical staff questions, especially when you’re unclear as to what is going on. Everyone needs to be their own health care advocate or have family or close friends who can do so. y family was lucky to have been able to leave Vietnam during the wartime in 1975, when I was 2 years old. My parents always taught us a good work ethic and the importance of getting a good college education. I went to college at the University of Illinois at Chicago, where I received my BSN degree in nursing. I have been a cardiac nurse for the past 22 years, with 16 of those years at Boone Hospital Center. My husband and I have two children and have been married for 16 years. Why did you get into the health care field? When my family arrived here from Vietnam, my mother was diagnosed with a heart murmur and needed her mitral and aortic valves replaced. My mom was lucky to have lived a much longer, better quality of life than if had she remained in Vietnam. I was very grateful when my mom did well after her heart surgeries, and I wanted to make it my life’s work to help other patients in the same position as my mother. I saw that nurses had a crucial role in helping their patients in their recovery process. What interested you in your particular specialty? Cardiac and cardiac surgery patients. I love to help patients and their families prior to surgery or procedures. I love to educate them, get them through that process, see them recover, and go home with their families to live a better quality of life. What is the most rewarding aspect of your job? Seeing my patients do well and hearing their stories of personal triumph. What is the most challenging aspect of your job? Doing the best I can for my patients and fellow coworkers. I’m always looking out for everyone, because everyone can always use a helping hand in one way or another. I wish I could be there for everyone when they need me. I hope I have made a small difference in someone’s life over the course of a day. What has changed in your field since you started practicing? The way things are done. When I started in nursing, there were charts in binders with paper orders, doctors handwriting orders, the secretary transcribing everything and nursing staff confirming all the orders. Now everything is computerized. What do you see changing in the next five to 10 years? Technology will be continually improving, including new heart medications and better procedures and techniques to help heart patients. I see it happening now. It can really make you hold back tears when you see how things keep getting better and better to improve the quality of someone’s life. What do you enjoy doing outside of work? Spending time with my family and friends. Being there for my children whenever they need me. Eating good food, just relaxing and having a good time in the outdoors. I love buying different fresh flowers for the house – I could probably use my own green house! My husband and I love ‘80s music, going to concerts and traveling. What advice would you give to someone looking to become a nurse? Give yourself time to understand and observe those around you. It will give you an idea what’s best to do in all situations. As in life, in nursing, you learn with time how best to handle things. Be proud of yourself for the little things, and the big things will eventually come to you with hard work and determination. Have confidence so that others have confidence in you. to Columbia. Decades later, Bob Wagner would be elected to Boone Hospital’s Board of Trustees. With three grandchildren in their teens and active in multiple sports, staying active is a priority for Brenda and Bob. “We follow all their games – basketball, softball, football, baseball and soccer. It keeps us busy!” Brenda and Bob have been married for 53 years and like to do many activities together. Last spring, Brenda had an idea: “I suggested we go to the Fitness Center for an hour, two to three times a week.” After visiting the facility, Bob agreed to try her plan. exercise, why I’m doing it, and she’ll tell me when I’m doing good.” Brenda’s trainer also lets her know when she can safely increase the intensity on an exercise. “On my own, I would push myself too hard, then I’d get sore and I’d quit,” she says. “But here, nobody’s pushing you. You do it at your own pace. They’re very good about helping you and showing you how to be safe.” Brenda also enjoys emotional rewards from personal training. “I’m so proud of myself! I’ve shown myself that I don’t have to be that person who can’t stand while putting her sock on. I am determined – and I will win,” she says. Perhaps the only people with mixed feelings about Brenda’s progress are her grandchildren, because now she can do things they’d normally do for her. “I know they like doing things for me. If it weren’t for me, nobody would pick on them,” she says, laughing. For Brenda, it’s definitely a win to keep up with her loved ones and friends, many of whom she discovered also exercise at the Fitness Center. “All the cool kids are here! Just coming into the Fitness Center, where it’s bright and people are shining and they’re fun to be with, is an emotional high.” By Jessica Park Whether you want to start a new fitness program on the right foot, need new ideas for your exercise routine or want to see more progress towards your goals, Boone Hospital’s Community and Medical Fitness Center offers personal training with certified exercise physiologists to help you develop a safe, effective workout program that’s customized to fit your needs. For more information, contact the Fitness Center at 573.815.3876. March or Jog in Place Stand with both elbows bent at 90-degree angles and feet shoulder-width apart. Swing left elbow forward while simultaneously lifting your right knee towards chest. Repeat motion, alternating between your left knee/ right elbow and right knee/left elbow. Variation: Seated Marching. Sitting on the front half of a stable chair, alternate arms and lift knees towards chest. Find a stable surface, like a countertop or wall. Stand 1 to 2 feet away from wall or countertop, with feet shoulder-width apart and your weight on balls of your feet. Place your hands about shoulder-width apart, palms flat on the surface (if using a countertop, you can grip the counter’s edge with palms). Extend your arms so that they’re straight out in front of your shoulders, with elbows fully extended. Brace your core so your back keeps a straight line from your heels to shoulders. Slowly lower your body towards the surface, bending your elbows until they form a 90-degree angle. Return to starting position by pressing through your palms into the surface until elbows are fully extended again, using controlled movements and keeping your back straight. Bodyweight Squats Stand with your feet shoulder-width apart and toes turned out slightly. Brace your core, and begin movement by bending hips and knees, driving buttocks and hips backward as if sitting into a chair. Keep knees out, and head and chest up, as you bend to a comfortable depth, ideally with your hip joint is slightly lower or even with knees. Pause briefly, then return to starting position by driving up through your heels, straightening knees and hips. Variation: Sit Stand. Sit on front half of a stable chair and perform the squatting motion. Drive through your heels to stand. Return to seated position in slow, controlled manner. Triceps Extension While standing or seated in a chair, brace core, elbows bent 90 degrees at your side. Press arms straight back, moving away from body. Be careful not to hyperextend elbows. Pause to squeeze back of your arms at this level, then return to starting position. To increase resistance, perform the movement holding light dumbbells or soup cans. Wall Sits Start with your back flat against a wall and your feet shoulder-width apart. Brace your core and keep your shoulder blades and lumbar spine in contact with the wall. Slowly slide buttocks down the wall, walking your feet out until your knees form a 90-degree angle and thighs are parallel with the floor. Hold this position as long as you can. Return to starting position to rest as needed. March or Jog in Place Set a faster pace to get your heart rate up! Variation: If you canâ&#x20AC;&#x2122;t reach a 90-degree knee bend, hold wall sit at a depth that challenges you, where you can feel tightness in your quads. Lateral Leg Lifts (30 seconds each leg) Stand behind a stable chair or solid surface, like a railing or counter. With feet shoulderwidth apart, brace core so that your back remains straight. Use the chair or surface for balance as you place weight on right foot and lift left foot 2 to 3 inches from floor. Lift left leg laterally, to the side, as high as possible or until you reach a 45-degree angle at the hip. Return leg to starting position in a controlled manner. Repeat for the desired number of repetitions before switching legs. Start with hands straight down at sides, palms facing your legs. Keeping elbows tight to your side, bend elbows toward front of body until hands are at shoulder level. Pause briefly, then press hands upward and overhead, extending your elbows. Pause for a second at full extension before returning to shoulder level. Pause briefly at shoulder level, then return to starting position by straightening elbows at sides. Use a stable chair or countertop for balance. Stand a comfortable distance from counter, with feet flat on floor and shoulder-width apart. Keeping toes and balls of your feet on the floor, drive heels upward to full plantar flexion. Pause briefly at the top and return to starting position in a controlled manner.